I had some salmon fillets and fresh asparagus in the fridge, and I knew I wanted to eat them for dinner. I often roast some sweet potatoes (or new potatoes) or make risotto to go with it, but I wanted to branch out a bit tonight. Since I’ve been on a poached egg kick, I thought that sounded like it could be a good fit. 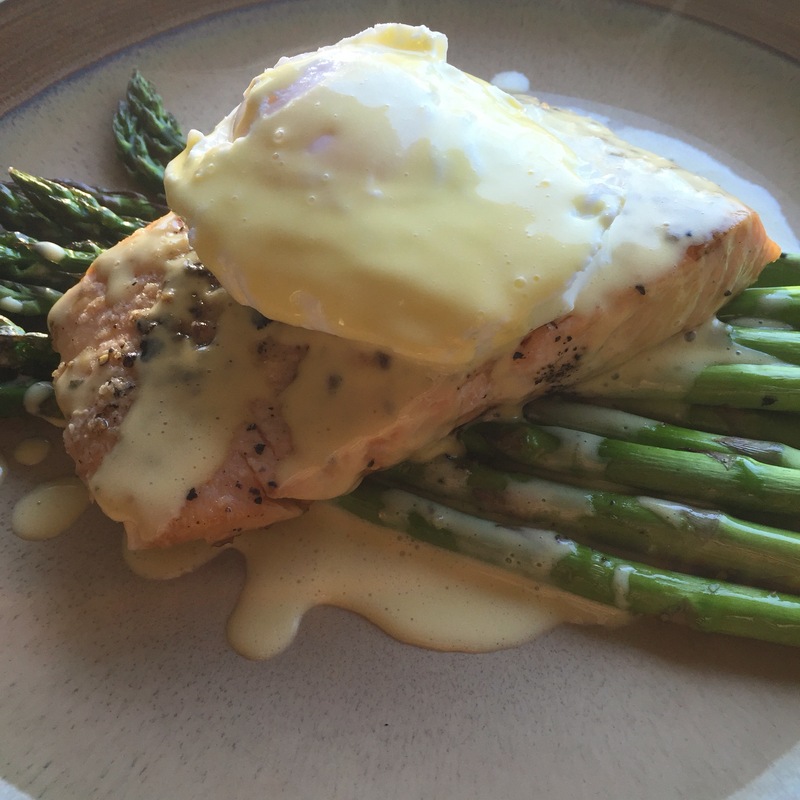 When I’m a little unsure about those types of ideas I like to do some Googling to see if anyone else has tested it out — and they had, and many of them topped it with Hollandaise sauce. In my past life, Eggs Benedict was one of my favorite meals. Since I couldn’t have dairy or citrus for years, I kind of gave up on it. Citrus no longer bothers me (as long as I overdo it), and I managed to find a pretty tasty dairy-free Hollandaise recipe! The recipe I used was from Against All Grain, which is a blog I hadn’t visited before, but plan to spend some time dissecting now 😀 It replaces the butter with coconut oil, and is made entirely in the blender. A few notes: I made it in my Vita-Mix, and so instead of the boiling water step, I just put water in it and let it run in “Hot Soup” mode, and let it sit while I prepared other aspects of the meal. Additionally, the recipe made a small enough amount that the blade couldn’t mix the eggs and juice until I added the coconut oil. I saved the leftovers and if they warm up well tomorrow, I’ll just make a double-batch next time to fix that problem! If they don’t, I may try the food processor instead. This wasn’t a huge deal, but I had to mix it for longer and on a higher speed to get it to the right consistency. For the asparagus, I snap the tough ends off, drizzle with olive oil, salt and pepper, and roast at 400 degrees for 10 minutes. It’s so amazing that I haven’t made asparagus any other way in years. I’ve already mentioned poaching eggs here, but I’ll try to sum up my process briefly. Bring a few inches of water to a boil. Add a little vinegar (I usually use rice vinegar since it doesn’t impart much flavor to the water) and reduce to a good simmer. Crack an egg into a small ramekin or prep bowl. Swirl the water to make a little whirlpool, gently pour egg into the middle, and set a timer for 4 minutes. Continue to swirl the water for the first minute or so to keep the egg and white neatly contained, and then periodically over the last couple minutes to keep the egg from camping out on the bottom of the pan. Sometimes it is done in closer to three minutes, so don’t leave the room! Remove with a slotted spoon, and voila! Poached egg! 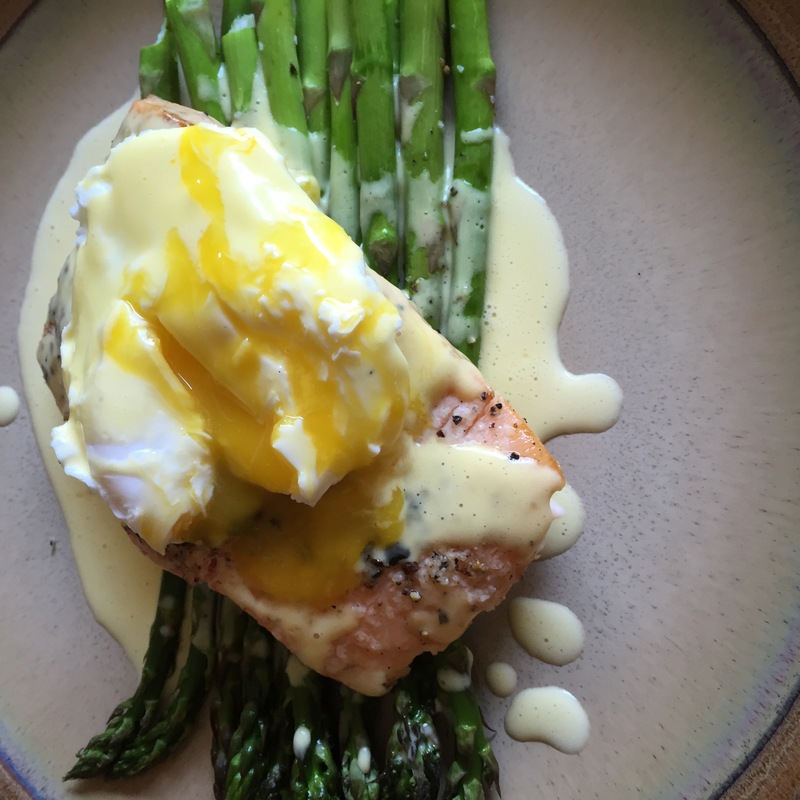 On the plate I laid out the asparagus, removed the skin from the salmon and placed the fish on the asparagus, topped that with a poached egg, and drizzled hollandaise all over everything. Yummy! Next Post It’s garden planning season! Are those pictures taken with you iPhone? If so, that camera lens is pretty awesome! Also, that poached egg looks utterly perfect. This looks truly delicious 😊, Chloe.